Do you guys remember when I was going through our house and decluttering at the beginning of Summer? I still have 2 rooms to go and I hope to get to them soon. I did finish all the bedrooms and I’m making sure one of our spare bedrooms is ready for guests. I removed all excess furniture from the bedroom and cleaned out the closet and the dresser drawers. Then I added a few details to make our guest comfy! This was our son’s room when he was growing up. Needless to say it didn’t look like this when he occupied the room. The paint color is the same…he picked the color and painted the room….good boy. Everything else has been changed. To get the room guest ready I added fresh flowers. I love flowers. They make me smile. There is nothing like adding a candle for atmosphere. I found the candle at Walmart. They carry the new American Home™ by Yankee Candles® brand. The tumbler style candle is very modern looking and I love the fragrance of the Pumpkin Apple Harvest. It smells like home….when someone is cooking an apple pie. You guys know I have a large quilt collection. This is one the hubby bought at an auction and it’s one of my favorites. He did a good job. 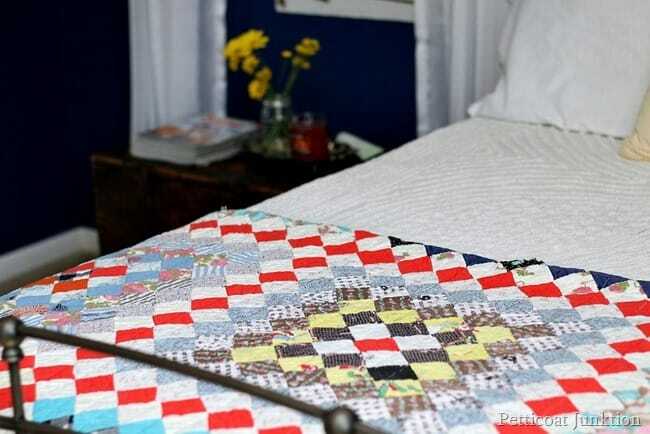 I keep a quilt on the bed and several in the closet for guest use. 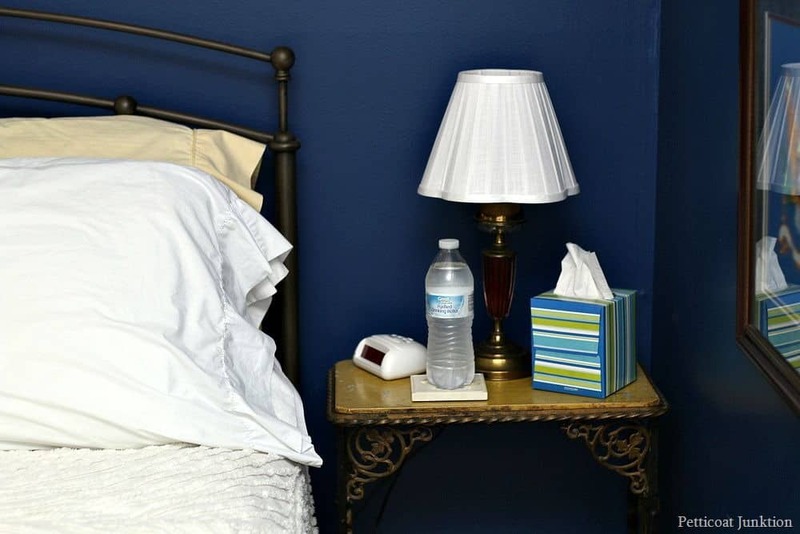 Every bedroom needs an alarm clock and a bedside lamp. I also keep a fresh bottle of water, coasters, and tissues handy for our guests. One of the bedroom walls is bare of furniture. Yea! I’m finding less is more. What about you guys? The wall does have a full length mirror which comes in handy for making sure you look presentable in the morning. The hubby and I have a full length mirror in our bedroom also. 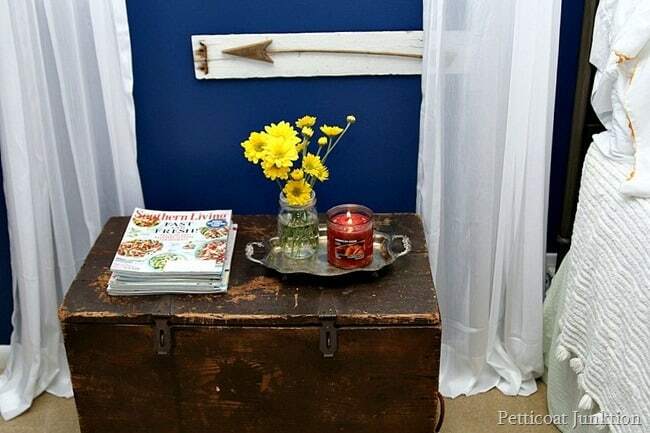 I keep a supply of magazines and sometimes a novel or two on the trunk which serves as a bedside table. I couldn’t resist lighting the candle while taking photos. It didn’t take long for the whole house to smell yummy! 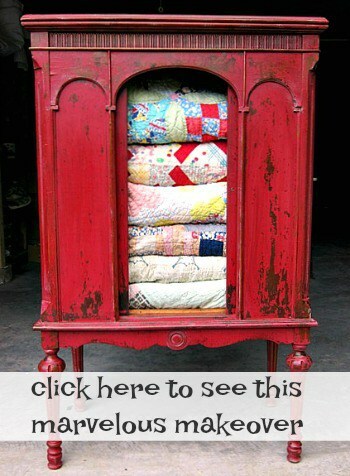 Always shop your home when redecorating a room or just adding a few additional touches. 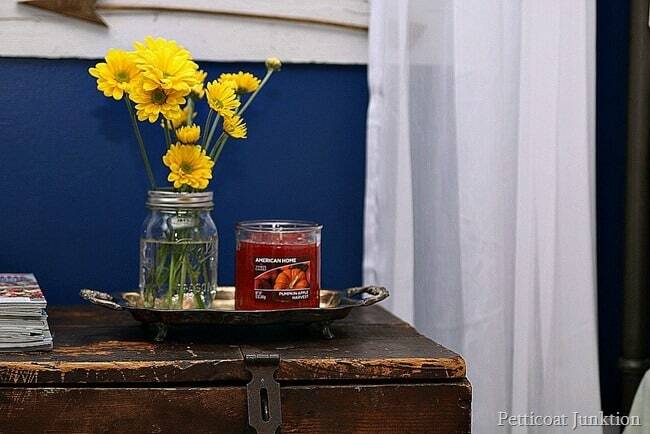 Everything in the room with the exception of the fresh flowers and the candle are things I always have on hand. The flowers were $4.97 and the candle was $10.93. 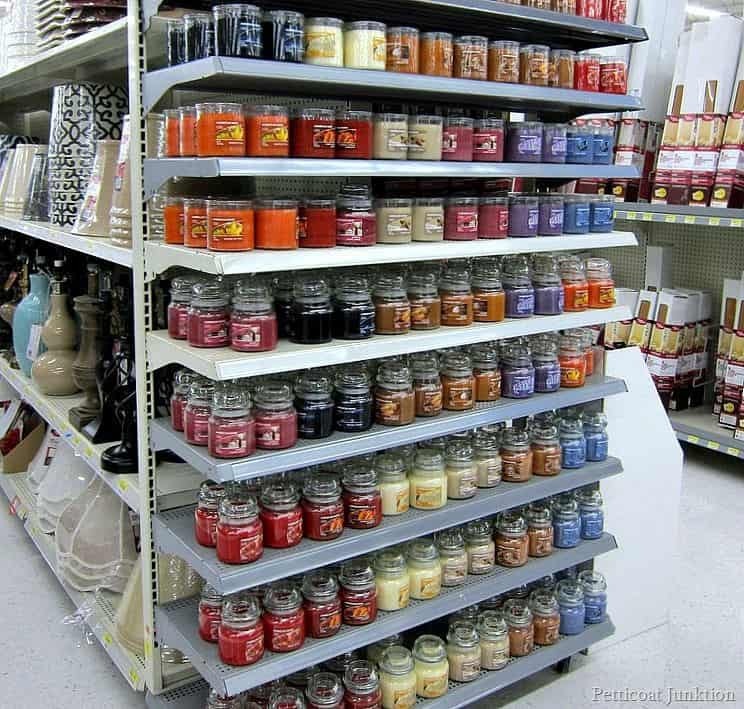 Walmart carries the exclusive American Home™ by Yankee Candles® brand. I shop at my local Walmart several times a week! Makes it really easy for me to pick them up when I’m grocery shopping! The candles are in the home décor, fragrance section at my local store. Who can stop at one candle? This fragrance is Sunny Sands. It reminds me of the beach. The candle looks great on the bathroom counter. 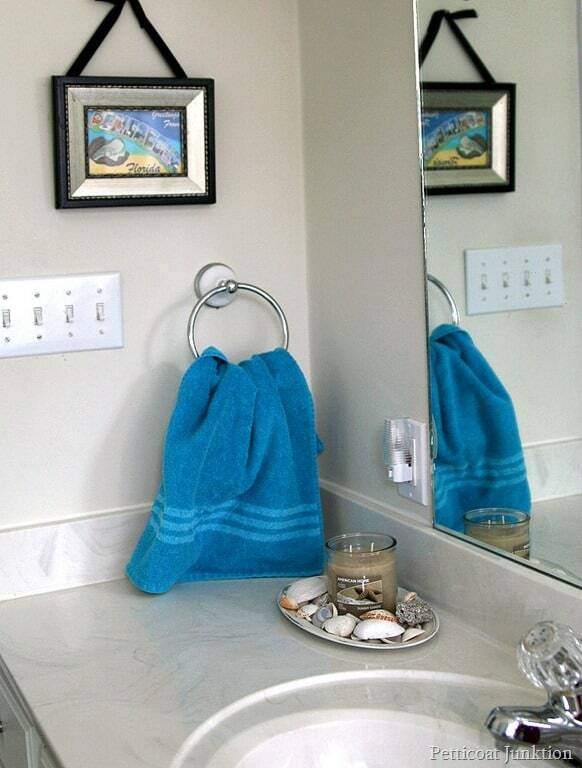 The display includes a white painted tray with seashells I picked up on the beach. LOVE. 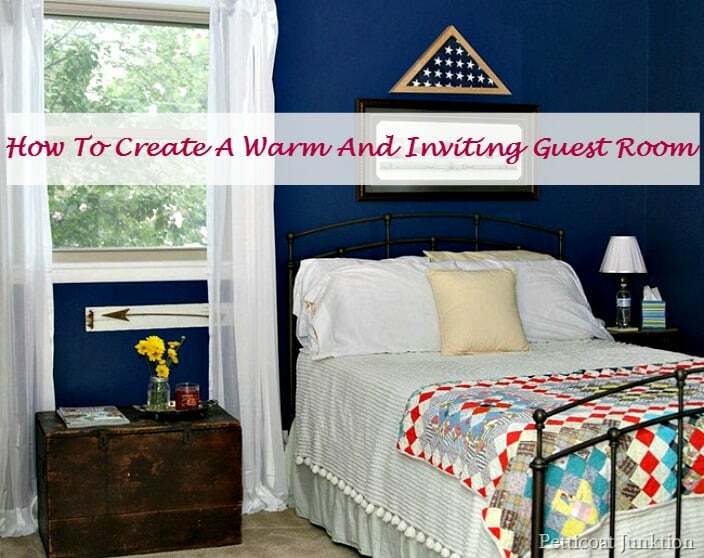 Do you have a guest bedroom? 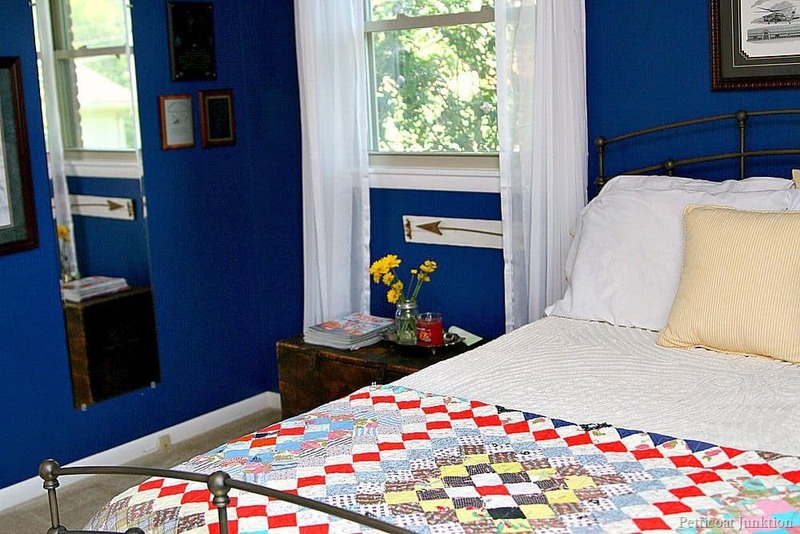 What do you think of our ” warm and inviting guest room “? Which room in your home could use an American Home™ candle? Leave me a note. I love hearing from you. Until tomorrow. We love having a guest room and I like decorating it for them (our son, wife, grandson) to relax and sleep in a bit while here and I gladly entertain my four year old grandson while they get some rest. I had a large professionally framed old photo of the boathouse in Wichita, with people in boats, and others picnicking on the banks in their stylish dress of the day with ladies in big hats and men in straw boaters, and that became my theme: water,marinas, blue, boats, etc., so I worked my decor from that angle, but not excessively overdone. 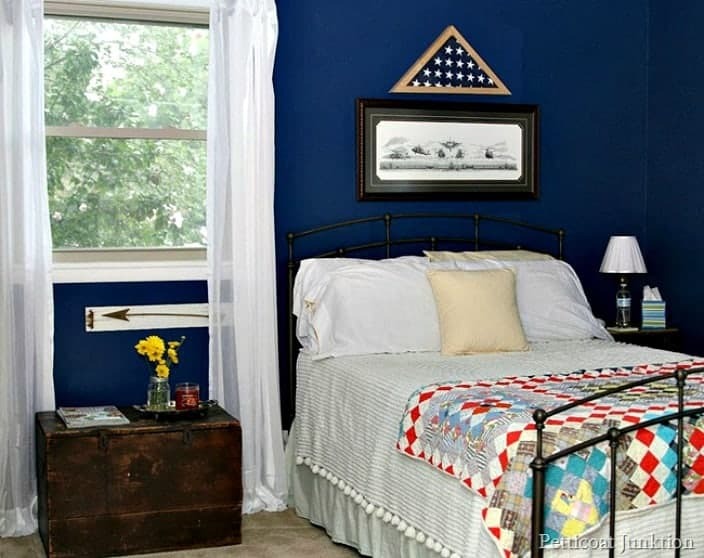 The walls are in a soft cream yellow, trim in Dover White, furniture all in marine blues (some matte, some gloss, for contrast),including an old iron bed, and more framed photos related to water (San Fran bridge, buoys, fishing, etc). A really cool wall clock, an etched look mirror with our last name, an arrangement of “country” wall plates, and some interesting mirrors I had found at HomeGoods and painted them in my blue, opposite the windows to mimic that layout. The windows have long sky blue leaf pattern burnout curtains I brought when we moved, and rose bushes outside the windows, looking out to green pastures, cows and tree lines. I had everything I needed, sitting around or in storage, and didn’t need to buy anything. It turned out great. Debbi the room sounds beautiful. I bet your son and his family love visiting! I like playing with my grandchildren also. It’s a beautiful guest room. I really like the pop of yellow from the flowers against the blue walls. Sign me up for a guest room visit. And just shut the door behind me, I could use some peace and quiet lately. haha, Come anytime. We can sit quietly together! I am still working on my guestroom and do hope it will be inviting like yours! 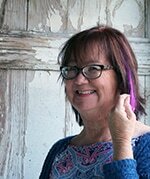 I am trying to figure out something for the window as it looks out on the carport area and a fence. I may plant a container garden and possible hang some “art work” on the fence for something to look at when drapery is open. I do not want to block the light as there is not much coming in so it will be a challenge. What do your guests see from their window? They see my workshop and deck out one window and a pretty flowering tree (at least right now) out the other. My kitchen window overlooks a fence, the carport, and a satellite dish! I feel your pain. If you come up with any ideas let me know. I am scent-sensitive, and the candle would have to go! The only time we would entertain overnight guests is when my daughter comes to NC from OH. There is no way I can accommodate her large brood, so there will be no separate quarters for them. Maybe in time, we will set up a guest room, but we are moving into a new house in September and don’t even have the furniture to do it. Blow-up beds strewn about the house is about as far as we went for our guests who have only stayed with us once so far in the last 10 years. They plan to come next year, but we are not the only vacation destination.